A Taskstream link is available in the navigation menu of all Canvas courses offered at IUPUI and the Schools of Education at IU South Bend and Southeast (unless the instructor has opted to hide it). Launch Taskstream from the course navigation menu. Alternatively, the link may also be available in the Modules or Assignments tool. If Taskstream is not an option in the course navigation menu, the instructor may need to add it. For instructions, see How do I manage Course Navigation links? If you already have a Taskstream account, you will be logged in automatically. If not, you will be prompted to accept the user agreement. Click I Accept Agreement. You will be taken to the account information page. When you create your Taskstream account, the "E-mail address:" field should already be filled in with an address using the form username @iu.edu. Do not modify this autopopulated email address as doing so will break the integration with Canvas and/or CAS. Fill in the remaining fields, and then click Continue. You will be logged into Taskstream. The next time you launch the Taskstream link in Canvas, you will bypass the account registration process and be logged in automatically. 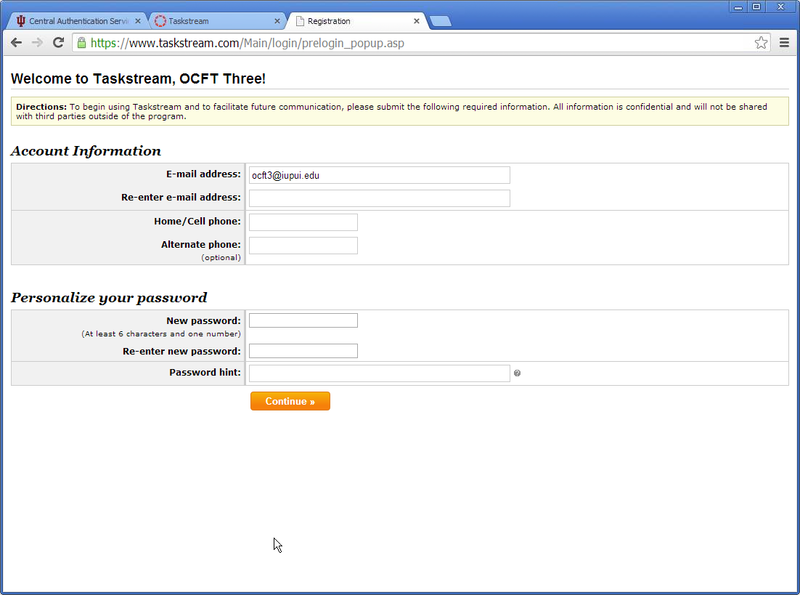 For information on other login methods, including logging in via CAS, see Log into Taskstream. This is document bfng in the Knowledge Base. Last modified on 2018-08-09 06:02:07.